Frostbite: Damage to tissues from freezing due to the formation of ice crystals within cells, rupturing the cells and leading to cell death. First degree injury: When only the surface skin is frozen, the injury is called frostnip. Frostnip begins with itching and pain. The skin then blanches and eventually the area becomes numb. Frostnip generally does not lead to permanent damage because only the top layers of skin are involved. However, frostnip can lead to long-term sensitivity to heat and cold. 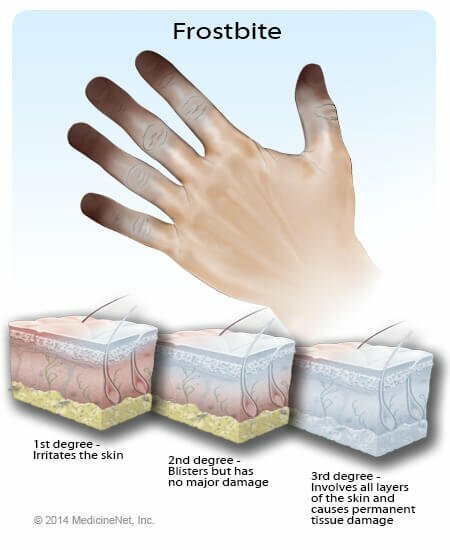 Second degree injury: If freezing continues, the skin may become frozen and hard while the deep tissues are spared and remain soft and normal. This type of injury generally blisters 1-2 days after freezing. The blisters may become hard and blackened. However, they usually look worse than they are. Most of these injuries heal over 3-4 weeks. although, again, the area may remain permanently sensitive to heat and cold. Third and fourth degree injuries: If further freezing continues, deep frostbite occurs. All of the muscles, tendons, blood vessels, and nerves freeze. The extremity is hard, feels woody, and use is lost temporarily, and in severe cases, permanently. The involved area appears deep purple or red with blisters that are usually filled with blood. This type of severe frostbite may result in the loss of fingers and toes. It can take several months to determine how much damage has actually been done by the freezing process. For this reason, surgery to remove tissue that is not capable of surviving is frequently delayed. Prevention: The best way to prevent frostbite is to dress warmly and move indoors once your fingers or toes begin to feel cold. Always keep your hands and feet dry and your ears covered. Treatment: The best way to warm a frozen part is to put it into a tub of hot water at 104-108 degrees F (40-42 degrees C). Make sure to test the temperature of the water with a thermometer or a hand that is not frozen! Do NOT thaw the extremity if there is a risk of it re-freezing! It is best to leave the part frozen until it can permanently. Refreezing leads to more severe damage. If you are camping and unable to get indoors, leave the extremity frozen. Do NOT burn the injured area (which may lack feeling). Warming over a fire or next to a heater should be avoided! These methods have a high risk of burns and tend to dry out the injured tissue, thereby causing more damage. Do NOT rub the extremity with snow. Any rubbing may aggravate the injury. The injured tissue can be fragile and must be handled gently. There may be considerable pain when the frostbitten area is rewarmed. Acetaminophen (Tylenol and others), aspirin, naproxen (Aleve and others) or ibuprofen (Advil and others) may be used to help the discomfort. If stronger pain measures are needed, contact a physician.